K-Swiss footwear design and inspiration is founded in tennis. Their footwear is best described by one of three pillars: Courtstyle (lifestyle), Court Performance (Tennis) and Court Fitness (training). 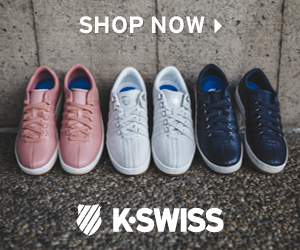 From now until June 26th, K-Swiss is holding their Summer Sale. Receive 40% Off Site-Wide plus Free Shipping when you use the code SUMMERDAY1 at checkout.